There is nothing worse than trying to milk a goat that is kicking and jumping. I found the secret on how to milk a difficult goat using goat hobbles. 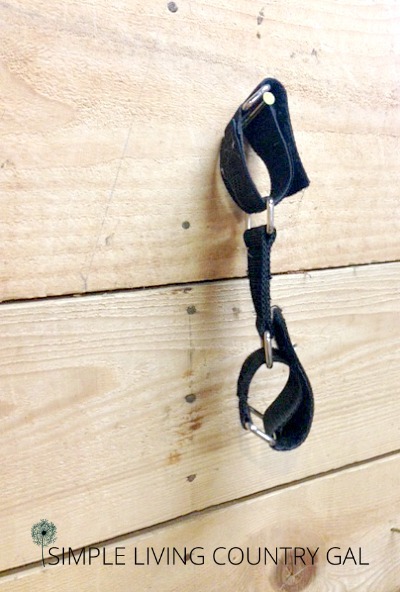 Learn the best way to use hobbles so you are able to keep you and your goat safe on the milk stand. You see, I have this goat that just hates to be milked. She is a loving goat, wants as many hugs and kisses as I will give her but milking is not her cup of tea. Her name is Wren and this story is how I tamed her in the milk stand using goat hobbles. I have told you about Wren before, she is my Alpha female and ironically enough she is afraid of her own shadow. One day I had put a black mat on the milk stand to give the does more traction and to prevent slipping. I walked Wren up to the stand and just before we got to it she stopped dead in her tracks. She took one look at that black mat and ran off the other way! No matter how many times I tried, she refused to step up onto the milk stand. I had no idea why at first but then realized it was that darn black mat. So I removed the mat and tried again. It took a couple of attempts, but she finally did go up into the milk stand. Oh…my crazy quirky goat Wren, how I do love her. Wren is a sweet goat, but a complete handful to milk. She basically resembles an Irish step dancer bouncing all over the stand when I milk her. I used to milk as fast as possible so I could get done before she finished her feed and kicked the milk bucket over. After a few weeks of milking fast, I decided I needed to find a solution that would work for both of us. I did some research and found Goat Hobbles. I had never heard of them before and I was very intrigued. 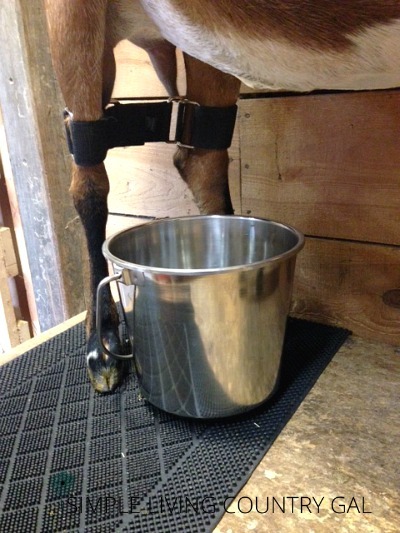 What are goat hobbles and how can I use them to keep a goat from kicking the milk bucket? Goat hobbles are a binding tool for the goat’s hind legs that help to hold them in place. They restrict movement just enough so you have time to move the milk bucket before she can kick it over or stick her dirty foot inside altogether. There are several ideas for making goat hobbles available on Pinterest and to be true to my cheapskate self, I admit I did try them out. Even though the homemade hobbles were a success for the poster, my Wren wriggled out of those babies faster than lightning. I finally bit the bullet and purchased a pair online. After quite a bit of searching, I found these goat hobbles on Amazon and I really like them. The straps are wide and thick and the velcro is sturdy enough to keep the doe from kicking out easily, yet are easy to use and to adjust. I have to stop here and say that those goat hobbles were the best money I have EVER spent on anything. How to milk a difficult goat using goat hobbles? 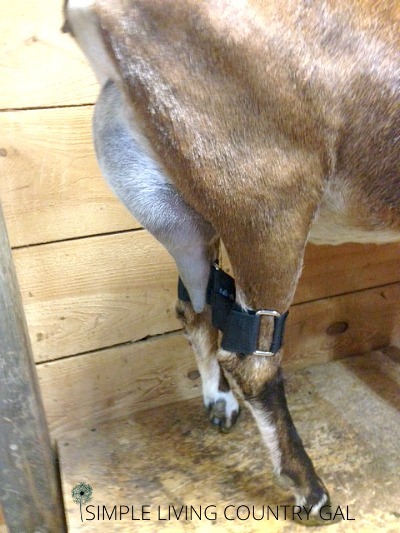 Hobbles are simple really, just a wide Velcro strap that you wrap around each of the doe’s upper legs. Once secured into place the hobbles will keep your goat from kicking and jumping keeping both you and her safe on the milk stand. Funny thing is, Wren never fought the goat hobbles! The first day I used them I put them on without any fuss from her. After they were in place she did try to kick and jump but she quickly found that she was unable to do so and settled in to eat without any more shenanigans. Where to place the goat hobbles so they work effectively? When you are milking a difficult goat, it is important to make sure the hobbles are on the goat’s upper back legs. If you put them on the lower leg, your goat will simply kick them off. By placing them up high you will keep her legs secure yet still allowing her some movement. This helps her to remain calm once the hobbles are secured into place. The side view shows the placement a bit better. If you find the goat hobbles get in the way of your milking you might need to adjust them a bit or adjust how you milk. If your goat’s teats are longer you can easily move them in front or behind the hobbles. If your goat’s teats are smaller then you might need to adjust how you milk a bit. Since we began using the goat hobbles with Wren she has been milking like a champ. But like with anything that has to do with goats, it is super important to keep your cool especially when milking. Goats are a very emotional animal and remember things for quite a while. One smack in the milk stand might cost you weeks of retraining. So, take a breath, shake it off, and remember your goats are simply animals that get easily spooked and are not doing anything intentionally. Another great use for Goat Hobbles is if you have a doe that refuses to let her kids nurse. I had one such doe that out of nowhere stopped nursing her young kids. I tried holding her but since I have large Nubian goats, holding is simply not an option. If they don’t want to do something force is not going to cut it. I then got the idea to put her up on the milk stand with some feed to use as a distraction. I put her buckling up and she still kicked him off so I decided to give my goat hobbles a try and they totally worked! Those Hobbles were a lifesaver and kept me from having to bottle feed that little buckling. A closer view shows how easily she wears them and Dusty (her little buck) is able to nurse with no problems at all. Absolutely! Not only are they humane but the goat hardly notices them at all. The velcro is secure enough to hold your animal in place yet not so binding that you can’t get them off quickly in an emergency. The velcro allows you to put them on quickly and adjust the tightness so the animal is comfortable at all times. It is very important to make sure to use them on the upper leg to be effective. If you put them onto the lower leg, she will simply toss them off with a kick. Another use for goat hobbles is maintenance time. If you have a goat that hates to have their udder shaved, body clipped, or other routine work by using the hobbles you will save yourself a headache and possible injury. By securing the back legs you will be able to do most of your routine work without too much trouble. Goat Hobbles will not only keep both you and your doe safe but help you to milk a difficult goat. One final tip, make sure the hobbles you choose will fit your goat. 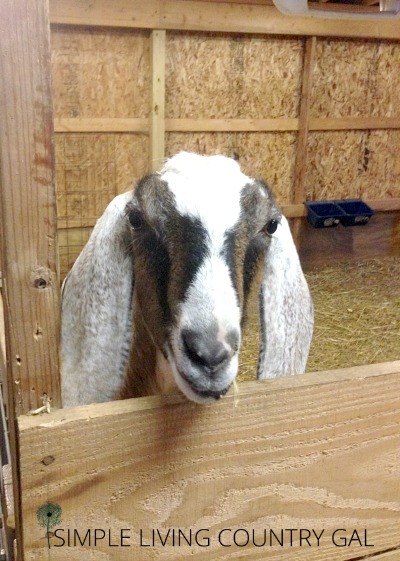 The hobbles mentioned in this post are for a large full breed Nubian goat and may not fit a dwarf goat or mini goat. Read the specifications before you buy to make sure. If you have a doe that is anything like my Wren or Sparrow, I HIGHLY suggest the small investment into Goat Hobbles especially if you want to milk a difficult goat. 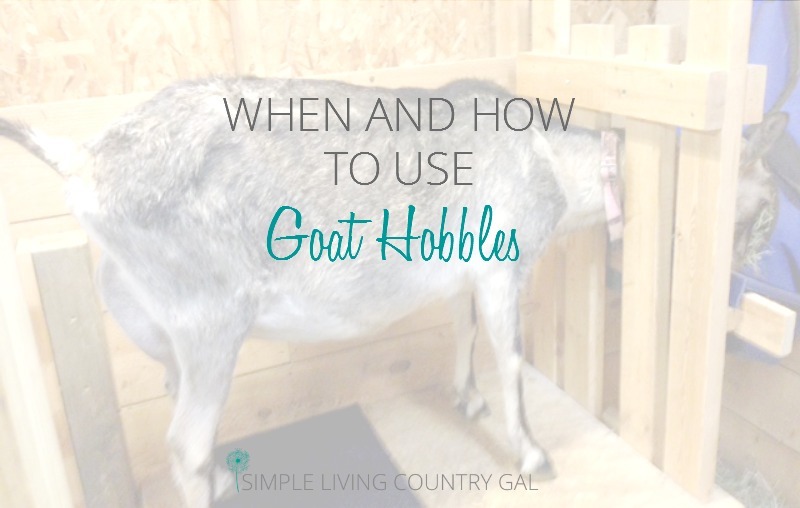 Do you use goat hobbles to help keep a goat from kicking the milk stand? Do you have tips on how to milk a difficult goat? If so please share in the comments below! You can find this post at my favorite Blog Hop!! « Best Organizing Tools That Actually WORK! I just bought those & it was a waste, but they don’t work on my Nigerian dwarf does. 🙁 Short legs means even less space above knee, they can fit, but even tightened down (as much as I feel comfortable doing with metal rings against tendons) they’ll shift down over knee in a minute, be kicked off & the jump game begins. So fustrating! This one particular doe won’t feed her 4 babies & I’d milk her for their bottles, but she has been a nightmare on the stand. She is this year’s milking doe for us, so I’ve got to figure something out! How frustrating they do not make hobbles in different sizes. I tend to forget the smaller goats since I have always had the larger breeds. Have you tried to make your own? I have found quite a few examples online. I know it did not work for me, but I have a much larger goat. I do feel your frustration and I hope you are able to figure something out. Goat milking should be fun and enjoyable! Maybe one of her kids will be more docile and a possible family milk goat rather than her? Thank you so much for sharing your experience with these! We haven’t used them before, but I was wondering if they actually worked – and on a difficult goat. Thanks so much for sharing on the Homestead Blog Hop too, I hope we see more great articles from you on Wednesday. It was my pleasure…always fun to be a part of one of the best Homesteading Blog Hops out there! !